Reclaim Yourself Women's Retreat : Happy St. Patrick's Day! Want a fun idea for St. Patrick's Day...if you haven't done anything yet...then hurry! There's still time before the kids get out of school! For the Cupcakes: Combine all ingredients until incorporated (about 30 seconds). Scrape sides of bowl and then beat on med-high speed for 3 minutes. Divide batter according to how many colors you are using. I used 5 colors and it worked out to a little over 1 cup for each color. Use food coloring to color batter to desired intensity. Wilton brand gel colors have the brightest colors and wont thin your batter. They can be found at Walmart or Michaels. 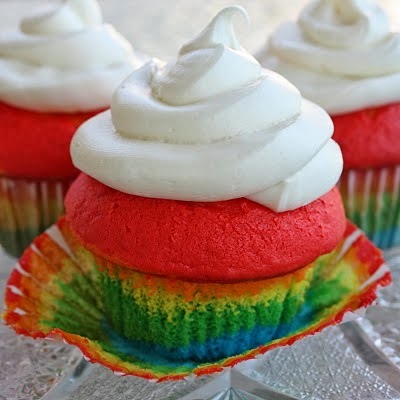 To get a layered stripe like I used, you'll want to put a spoonful of each color in the cupcake one at a time. The batter is thick, so it won't spread on it's own. A great tip is to set out a little bowl of water where you're working. Dip your finger in the water and then gently spread the batter out. The water will make it so the batter doesn't stick to your fingers. Another tip is to use a measuring spoon and some water to measure out how many teaspoons/tablespoons are going to fit in your cupcake. Then divide that by how many colors you have so you know how much of each color to use for each cupcake. For my 5 colors, it worked out perfectly with 2 t of each color in each cupcake. So I put in 2 t of blue in the bottom of each cupcake and spread it out with my finger. Then I put in 2 t of green on top of that, then yellow, etc. Bake them according to the package directions, until a toothpick comes out dry. Makes around 15 cupcakes. Frost with your favorite frosting. Fancy it up by putting the frosting in a ziplock bag. Cut of the corner of the side of the bag and you have an instant frosting decorating bag. For the frosting: Add butter and powdered sugar and beat until light and fluffy. Add the coconut extract, vanilla extract, and salt. Mix until combined. Gradually add milk (you may not need all of it) and beat for 2-3 minutes until fluffy. Frost cooled cupcakes. Add rainbow colored sprinkles if desired. My Craft Channel is Sponsoring! !